Growing up in San Diego I listened to a lot of radio, of course I enjoyed the music like all the other kids, and the jocks were always entertaining with the bits and fun that they brought to radio. There was always that geeky side of me that loved something else on radio, the traffic reporters. I still really don't know why. Maybe it was the technical aspect of airing the reports. But that appreciation never faded. Even today I have a special place in my heart for traffic reporters. I know it is not the easiest job as most have to get up early, work several hours, only to return for drive time. I know they are appreciated by management, I don't doubt that. But I wanted to do something more. 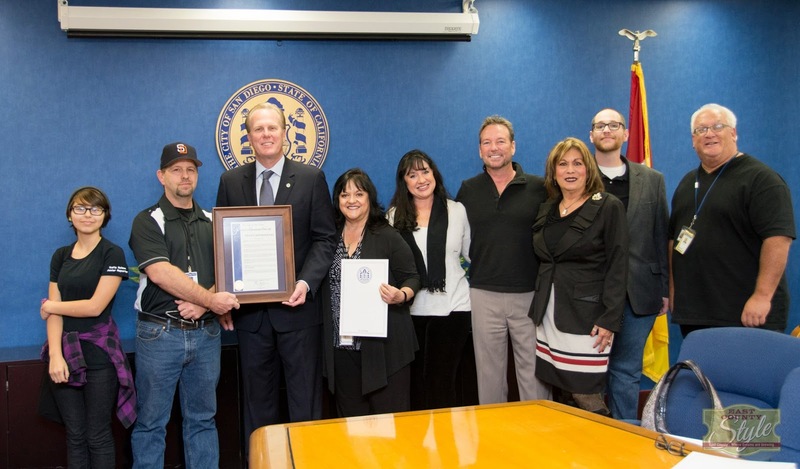 For the last several months, I have been working with Mayor Kevin Faulconer's office to arrange a special day for San Diego Radio's traffic reporters. That day came to fruition today as Mayor Kevin Faulconer himself presented those who could attend with a proclamation from the city for their tireless work. Those in attendance today were Monica Zech, Lupita Ramirez, Rick Lawrence, Marsi Latimer, John Monte, Ryan Hunter, and Jeff JT Stewart. There were many more invited but sadly could not attend due to having to work. All were given copies of the proclamation and for those who could not attend, I have yours with me. Traffic Reporter Day San Diego from East County Style on Vimeo. Thank you Mayor Faulconer and staff for taking the time for today, this is wonderful! Also I would like to offer a very special thanks to Ron and Karen Cook from www.EastCountyStyle.com for coming to take photos and video. 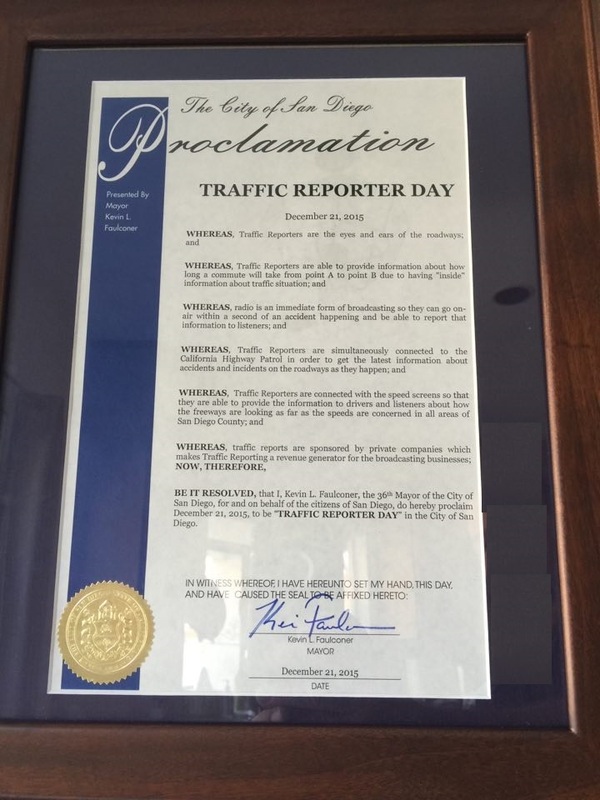 So let it be known that December 21, 2015 is "Traffic Reporter Day" in the City of San Diego. 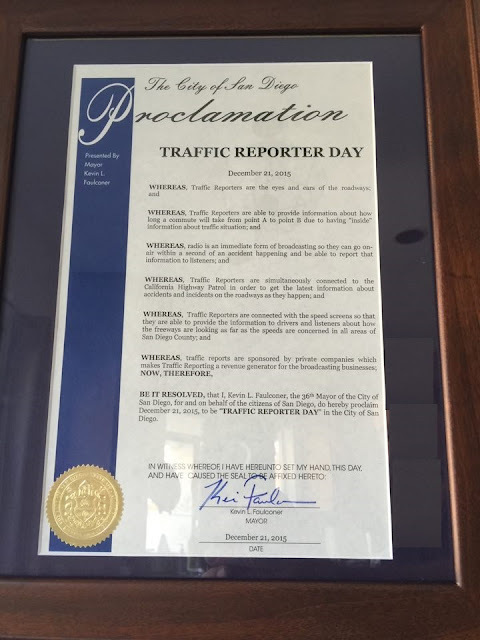 Thank you to all traffic reporters! Very nice, Joe and Mayor Faulconer! 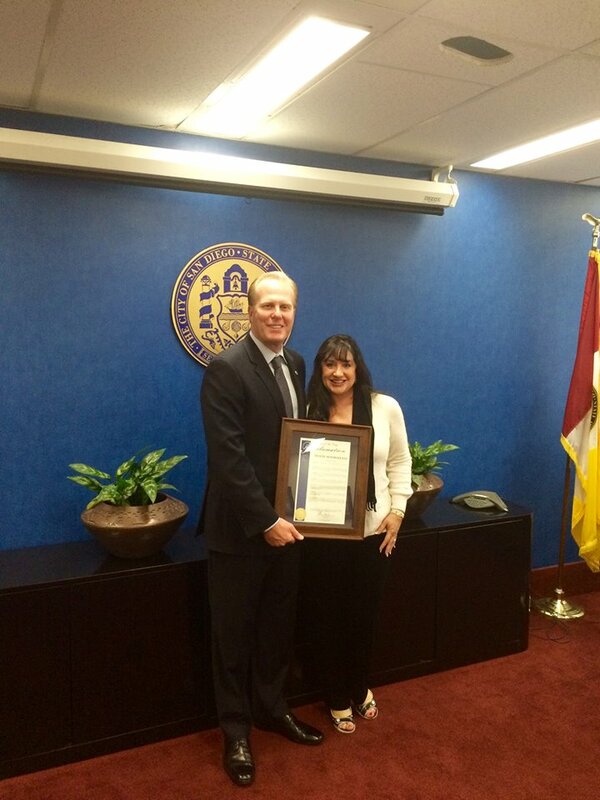 It's an honor Mayor Faulconer! ¡Muchas gracias!